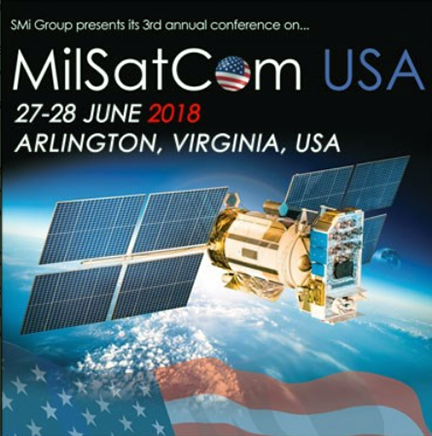 SMi's third annual MilSatCom USA conference is returning to Arlington, Virginia, USA on June 27 and 28, 2018, focusing on identifying and optimizing next-generation SATCOM. Tim Deaver, Director US Space Systems, Airbus Defence and Space, Inc. The two-day conference will also feature a networking reception taking place at the Airbus Experience Centre at the end of day 1 where a tour, followed by drinks and canapes, will be provided. The reception will provide delegates with the opportunity to foster new working relationships by engaging directly with military and industry representatives at the Airbus Experience Centre in the heart of Washington DC. Latest confirmed attendees include: Australian Department of Defence, British Embassy, Canadian Defence Liaison Staff, Department for International Trade, DISA, Joint Staff, JSAT International Inc., NATO, NATO Communications and Information Agency (NCI Agency), O3b Networks, OSD CAPE, SKY Perfect JSAT Corporation, Spectra Group, Teldat, Thales Alenia Space, The Boeing Company, The Joint Staff, U.S. Naval Research Laboratory, U.S. Special Operations Command, U.S. Strategic Command, White House Office Of Science And Technology Policy, XTAR, and many more. All active federal employees, including military personnel, will be granted free admission to the event. However, in order to attend this event, pre-registration is required, which is subject to final approval by the conference organizer.